You have seen this quilt before in various stages of construction. Here it is again–this time complete. The last stitches were taken on the binding a couple of weeks ago. I was waiting for the rains to stop so that I could take this quilt’s formal shot outside–today was that day. The sun shone today, people were out of hibernation walking around the streets, and I could almost be convinced that Spring is really just around the corner! I have been working less on my own quilts lately and more on customer quilts. The tally so far this year is 13 total quilts brought in for quilting–3 of which were mine. I have finished two of my quilts completely, the third is waiting for its binding to be sewn on. Of the 10 customer quilts that have come in this year, only 3 are waiting in the wings–one of those was received today. I have also been working on the “less is more” lifestyle. Pam has been talking about reducing the clutter in her life and this seemed like as good a time as any to follow suit. We have been re-organizing, sorting, reducing, throwing away, donating, and refusing to introduce anything futher into this house that we don’t absolutely need. As my husband said today, “Sadly, despite all the stuff that we have gotten rid of lately, it is hard to tell the difference!” Although this statement seems very true right now, I believe that if we continue to soldier on, you will be able to see a difference when you enter this house. It may take a long while, but we will get there. Eventually we will be liberated from all this clutter! 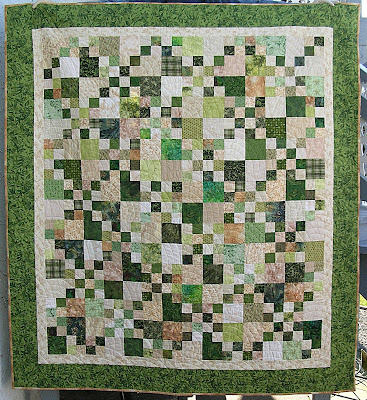 This entry was posted in customer quilt, double four patch quilt, less is more, weather by Norma Hanson. Bookmark the permalink. your quilt came out so nice. I love green so this quilt really speaks to me! A great way to use my green collection! YES I have been on a declutter my life mission the past few months as well. It is noticeable but still have a ways to go too. I do like this quilt and really must move it up on my to-do-list. Your choice of greens is terrific. Beautiful quilt! but then I have always liked the double four-patch. I like the idea of ‘less is more’ Time for me to jump on the declutter bandwagon *s* The 4 patch looks great! Such a pretty finish!! Love those cool, calm greens. Clutter is taking over everywhere! We too are getting rid of this and that…bit by bit! So when I meet my demise, they can just toss out my extra pair of undies and be done!! Congrats on getting this finished – it is lovely and just right for spring ! Pretty greens. Reminds me of cool grass and spring leaves. I like the double four patch. Great color selection. The Double 4 patch looks great – and very spring like. I started tossing some of the clutter out in anticipation of moving …again. Luckily I downsized a lot when we moved here last year. I LOVE your double 4 patch. I just finished one too..well the QUILTING part. I hope to get the binding stitched on so I have some hand work. Did Mary’s green quilt inspire you? It did ME! I would love to have one of these going ALL the time…hmmmm! Good for you, another one done. I love double 4 patches. I am getting ready to cut one myself. I like your greens. It is a beautiful quilt – it looks wonderful. The greens is really makes it look like spring. I’ve been working on reducing clutter as well – I think I’ve stalled a bit with that, because things seem to look messier, at least temporarily while I am decluttering, but I will get back to it soon. Love your quilt! We just painted the bedroom green, so I guess I’m into that color now. I’m with you on the clutter, OUT IT GOES!